You want to relax. So, chances are you don’t want a bunch of screaming children running around all day long. That is why the Secrets Maroma Beach resort is for adults only. That means that you can have a truly romantic getaway! This resort offers a spa, fantastic restaurants, and of course, a gorgeous view. Even better? If you get the Eternity Honeymoon Package, you can return for your first anniversary – and get a free night stay. Ready to relax? Then head to the Turks & Caicos Islands! If you just want to lie around by the pool and enjoy the resort – rather than spend your days visiting historic sites and attractions – this spot is absolutely perfect. This resort is all-inclusive, and there is an awful lot to do while you’re there. In fact, there are over 16 different restaurants, along with bars, pools, spa facilities, and a private beach. With so much to do, you can relax however you choose. Jamaica is one fantastic place to slow down and enjoy life. No wonder so many couples choose to spend their vacations here! 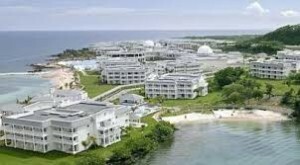 If you head to the Grand Palladium resort, you can enjoy the perks that come along with staying at an all-inclusive resort – including buffet dining, 13 bars at the resort, as well as participating in water sports. As a way to entice honeymooners to stay here, they can receive complimentary gifts and a free room upgrade if it is possible. Not too shabby! Who doesn’t dream of visiting Hawaii? This picturesque landscape offers many beautiful views – and just as many ways to relax. At the Turtle Bay Resort, they give newlyweds access to private hot tubs, sunset photography, and even a private butler service. With so many perks, it won’t be too difficult to experience an unforgettable honeymoon. You can also go horseback riding along the beach or go for a couples massage. Talk about romance! Fiji is one of the most beautiful places in the world. So, why not celebrate your union by relaxing at Tokoriki Island Resort? This is a great place to spend your honeymoon, as children under the age of 12 aren’t allowed to stay at the resort. That means more peace and quiet for you and your significant other! Plus, you can spend time by the beach, going snorkelling, swimming, playing volleyball, or even going kayaking. Whether you want to sit and do nothing or enjoy some activities, you have options. Need a little help choosing your honeymoon destination? Than consider some of these relaxing choices. It won’t be long before you’re having fun and starting a new chapter of your life.